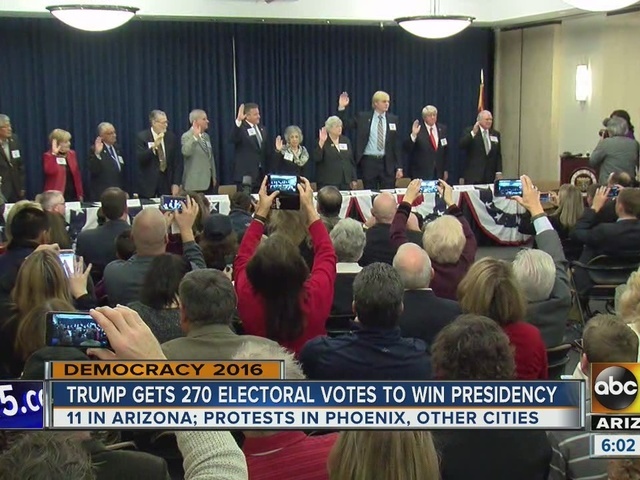 Arizona's 11 Electoral College voters ignored hundreds of opponents of Republican Donald Trump gathered at the state Capitol on Monday and instead voted for him to be the country's next president. The electors were all Republicans and were not expected to be swayed by the national effort to get them to vote against Trump to keep him from formally becoming president-elect. They were chosen by the state GOP because Trump won the Arizona vote. One of Arizona's electors says she was harassed. She's received thousands of emails trying to influence her vote. The campaign against Donald Trump wasn't just waged in emails to her, but in countless letters in her mailbox. Jane Lynch said all the cards didn't have any effect on her, and she left much of it unopened. 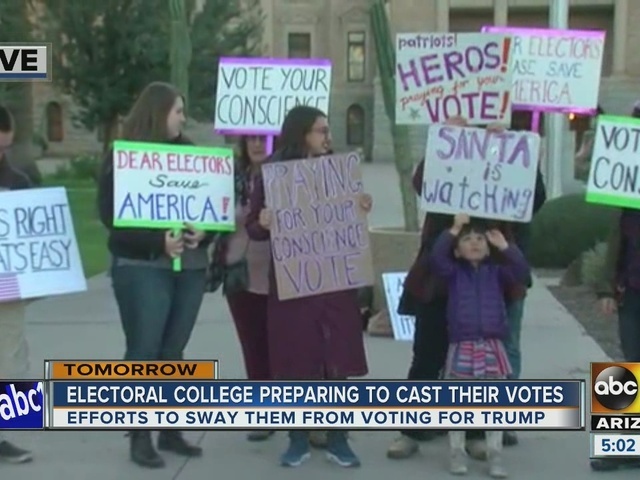 "They're entitled to their opinion, I love the fact that they're exercising their First Amendment right, but the reality is that voters in Arizona voted for Donald J. Trump," state party chairman and elector Robert Graham said. "It's great that they're activists, but it shouldn't stand in the way of the people, and that's what they're attempting to do right now. " 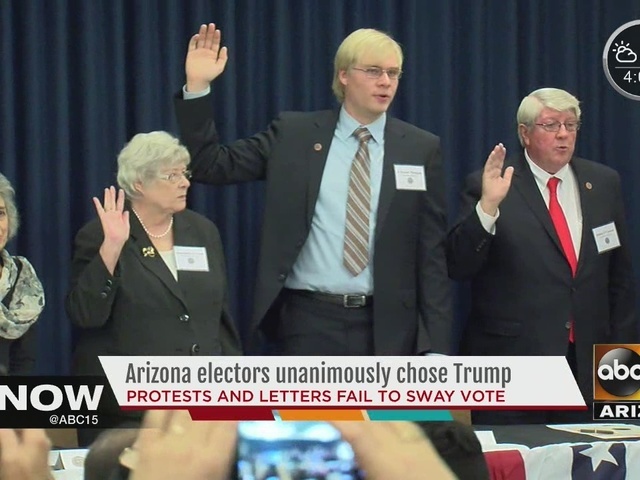 The Arizona meeting of the Electoral College, like others held across the nation Monday, was mainly a ceremonial event. Secretary of State Michele Reagan swore in the electors, and they then signed the official certificate of vote. By mid-afternoon Monday, Trump had secured the presidency by going above the 270 Electoral College votes needed for a victory. 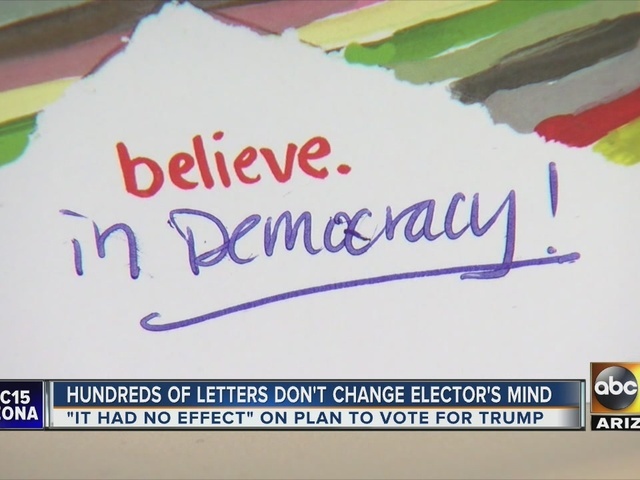 The effort by anti-Trump forces to persuade Republican electors to abandon the president-elect came to practically nothing, and the process unfolded across the nation largely according to its traditions. The protests at the state Capitol were held under heavy security, but they were peaceful. Trump opponents held signs saying "Hand-picked by Putin -- What could go wrong?," "Stop Trump," "Our electors should be our protectors" and "Alt-Wrong," a play on the alt-right movement currently embraced by some white supremacists and white nationalists to refer to themselves and their ideology. "I'm scared to death that we have the potential of Trump as president," said Ken Kobre, 70, a Democrat who is a professor at San Francisco State University and currently lives in Scottsdale. "I think all the positive things that happened in the United States in the past 50 years are going to be turned back, including climate change, including attitudes toward foreigners, including anyone who's any different than the straight white population." "It's a scary thing," protester Linda Forman said. "We're afraid of what's gonna happen with this guy,"
"I'm going to try to get a job in Washington come January because at some point all these people have to talk to each other and government still has to continue," protester Bethany Hamilton said. Vanessa Gamble of Buckeye said she wanted the electors to act independently and reject Trump, noting that the U.S. Constitution gives them that right. "It was put in the Constitution for a reason, for them to be able to exercise their vote, for the conscience of America, to not get a demagogue in there," Gamble said. "And I think right now they need to not worry about party, but worry about country." 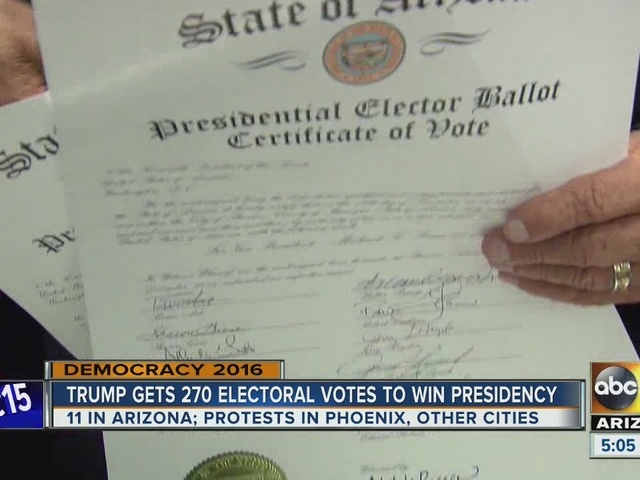 Elector Edward Robson, a Phoenix homebuilder, said he was surprised that there continue to be protests about Trump's election. "They say the country is divided, and somehow we've got to put it back together if it's possible," he said. 'We pledged way back in March, April that we would support whoever wins the primary," elector Alberto Gutier said. "We wrapped up the election and put a big red bow on it, and now it's over and people have to learn to accept it," elector Sharon Giese said. The protests marked the second-straight presidential election that saw an Arizona clash over a newly elected president. In 2012, several Republican members of the Electoral College in Arizona expressed doubts about the legitimacy of President Barack Obama's birth certificate and whether he was a U.S. citizen, including a GOP leader who said he didn't think Obama was "properly vetted as a legitimate candidate for president." Mitt Romney won the state's electoral votes in 2012, but the Republicans spoke out because Obama had won the national election.